The fifth entry in the blockbuster series, Pirates of the Caribbean: Dead Men Tell No Tales is a sequel that has the distinction of being both not as good as the still-best first film The Curse of the Black Pearl, while also being a big step up from the franchise’s purely forgettable previous instalment On Stranger Tides. Steered along by co-directors Espen Sandberg and Joachim Rønning, who are new to the series but do a fine job of matching its tone, Dead Men Tell No Tales falls somewhere in the middle of the franchise. It’s by no means the best of the films, but it ranks as a pretty good sequel that is fairly entertaining to watch, thanks to some cool special effects and a couple of solid set pieces. The hero of this film is Henry (Brenton Thwaites), a young sailor who happens to be the son of Will Turner (Orlando Bloom) and Elizabeth Swan (Keira Knightley). 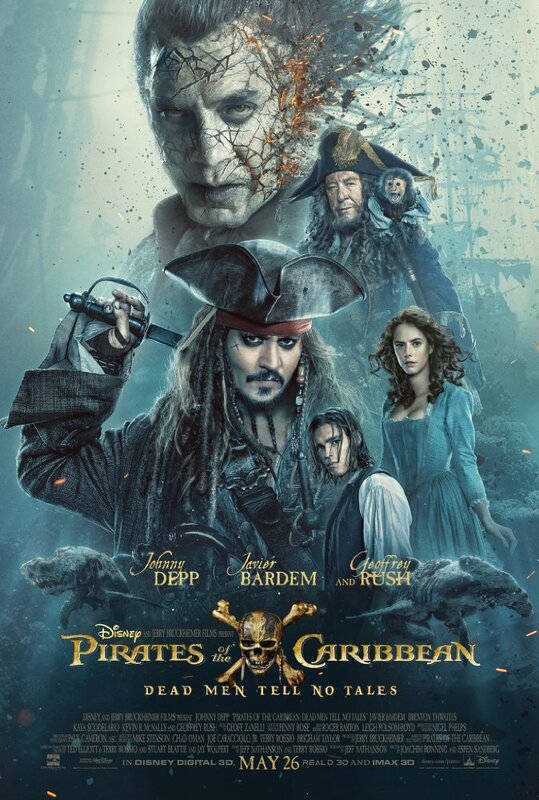 With his father doomed to a life underseas on the Flying Dutchman, Henry is determined to find the Trident of Poseidon, which is the only thing that can break the curse, and his best hope of getting there is to be guided by the generally inebriated Captain Jack Sparrow (Johnny Depp). The villain is the spooky and undead pirate Captain Salazar (Javier Bardem), who has been released from the Devil’s Triangle with his ghostly crew in tow and seeks vengeance on Captain Jack, killing everyone aboard Henry’s ship but sparing his life in hopes that he can lead him to his rival. Henry and Jack also find themselves teaming up with Carina Smith (Kaya Scodelario), a young female astronomer who escapes charges of being a witch, mainly because it was unheard of for a woman to practise science at the time, and seeks Jack’s compass to help her get to the Trident. Captain Barbossa (Geoffrey Rush) is also back sailing the high seas this time around, switching allegiances along the way. When The Curse of the Black Pearl came out in 2003, helmed by horror filmmaker Gore Verbinski, it instantly became a surprise hit. The film almost felt like a revelation in terms of how genuinely fresh and entertaining it was, especially for a movie based on a theme park ride. Gore Verbinski followed it up with the somewhat bloated but still fun sequels Dead Man’s Chest and At World’s End in 2006 and ’07, which explored more of the mythology while staging increasingly larger scale action sequences. Even if it isn’t quite as entertaining or textured as those films, Dead Men Tell No Tales fittingly provides much more of a proper follow up to them, while smartly ignoring the events of Rob Marshall’s lacklustre 2011 franchise extension On Stranger Tides, which served as more a spinoff than anything else. This film still feels a bit long, despite being the shortest in the series at 129 minutes, and the climactic action does get a little convoluted and hard to follow. Johnny Depp also doesn’t really bring anything overly new to his character here, which could be seen as both a blessing and a curse. Although he is still mostly amusing to watch, it can feel like he is now more coasting by in the role of Jack Sparrow, mainly because his Oscar-nominated performance in the first film remains such a tough act to top. This leaves plenty of room for series newcomers Brenton Thwaites, Kaya Scodelario and Javier Bardem, as well as franchise regular Geoffrey Rush, to carry much of the film, and they all do a fine job of it. The film looks great, with the visuals of Salazar and his ghostly crew being effectively creepy, and there are some solid action sequences especially in the first half. Some of the best set-pieces are the ones that embrace their own outlandishness, like an over the top bank heist early on that is very well staged and quite fun to watch, and a bit involving a spinning guillotine. When all is said and done, Pirates of the Caribbean: Dead Men Tell No Tales is entertaining enough to pass the time for fans of the series. Don’t go expecting the thrilling highs of the first instalment, but it’s still a decent and fairly fun follow up to the original trilogy, that has enough enjoyable moments to make it worth a look. Blockbusters nowadays seem to have endless sequels, creating franchise hits that do well with a predetermined fan base coming in. Even years apart, the Pirates of the Caribbean series has a new instalment – the fifth one in the series that started way back in 2004. The fourth film from a few years back strayed from the storyline of the first three, and really is not needed to understand the fifth film. It is the third film that should be watched beforehand, and in particular the scene over the end credits. Dead Men Tell No Tales takes place about a decade after the end of the third film, and Will Turner (Orlando Bloom) and Elizabeth Swann’s (Keira Knightley) son has grown up and is trying to break his father’s curse and free him from being captain of The Flying Dutchman. (Those who didn’t see the end credits scene on three are likely confused already.) Henry Turner (Brenton Thwaites) is a determined young man who is in a shipwreck caused by a ship of dead pirate hunters, where the ghost captain Salazar (Javier Bardem) lets him live if he will deliver a message to Jack Sparrow for him – that Salazar wants Jack dead. Henry has his own reasons to find Jack as well though, as he believes that Jack’s compass can help him find the Trident of Poseidon – the only thing that can break every curse in the sea (including his father’s). Young Turner also teams up with an astronomer named Carina Smith (Kaya Scodelario) who is about to be hanged, as people believe her to be a witch because of her knowledge of the stars. She in turn has her own goals relating to a father she never knew, following a star map left by him in a diary. Of course it is this map that Turner needs as well, as it will lead them both to the Trident. It wouldn’t really be a Pirates of the Caribbean film without Captain Jack Sparrow, and he is back as well, with his compass a key to finding what they need, and his connection to Salazar a threat to them all. Reintroduced in a bank theft set piece, Johnny Depp provides the same characterization that made the franchise such a huge hit in the first place. Quickly on the technical side of things, the score mixes a lot of elements from the first films, as the music of PotC became iconic in its recognizability. It works well here, although it is almost distracting how familiar it sounds, despite – or perhaps because – I like the score so much. The visual effects are quite well done, and are fun to watch on the big screen, which is what we hope for in a blockbuster that we are going to pay a premium to go watch in a theatre. Overall, Pirates of The Caribbean: Dead Men Tell No Tales is an entertaining blockbuster that shows that the Pirates series still has some life left in it. After the fourth one, the franchise seemed a little stale, but thankfully this one brings us back closer to what really worked about the first ones. If you can, watch 1, 2, and 3 beforehand, (seeing 4 is fairly unneeded for the plot of the 5th one), and enjoy another trip to the world of Pirates. Pirates of the Caribbean: Dead Men Tell No Tales is the fifth film in the Disney/Bruckheimer franchise based on the theme park ride, directed by the Danish team of Joachim Rønning and Espen Sandberg. Though shot digitally in Australia and the shortest Pirates film at just under two hours before credits, it has the highest budget so far at over $350M, mainly due to huge practical effects and “talent” demands. The “dead men” line heard in the ride itself refers to the ghost pirate Salazar (Javier Bardem) who spares one person to relate their experience from each ship he plunders. Outside the U.S. and Canada, most other countries (except Portugal and Serbia) use the alternate subtitle: Salazar’s Revenge. The plot revolves around a search for Neptune’s trident who’s possessor will rule the seas. Henry Turner (Brenton Thwaites) seeks it to free his father Will (Orlando Bloom) from the Flying Dutchman. Carina Smyth (Kaya Scodelario), condemned as a witch for her skills in science, was given a book which with her knowledge of astronomy can lead to the trident’s location. Captain Jack Sparrow (Johnny Depp) has fallen on hard times once again and his crew is losing faith in him. By pawning his compass for a drink, Jack accidentally releases Salazar’s ship from the Devil’s triangle into which he had led it long ago, and Salazar is out for revenge. Teaming up to find the trident, Jack, Will and Carina must keep both Salazar and the whole British fleet at bay, with the pirate captain Barbossa (Geoffrey Rush) also getting into the action. Though I now find Depp’s staggering portrayal a bit tiresome, there are enough witty bits and really impressive action scenes to make POTC5 a worthy addition to the series.